‘Sense of Place’, was a research project commissioned by Urban Living in 2009, to explore how people’s everyday experiences of their neighbourhood can be turned into active citizenship and neighbourhood renewal. The Soho Road and Dudley Road areas of Birmingham were used as a pilot because of their potential as housing growth areas. The project consisted of three phases: mapping events to find out what the local issues were; catalyst events to share project findings with local people; and a dissemination event to share findings with a professional audience. The areas were mapped through orthodox methods- visual observation, interviews and desktop research- and exploratory methods, such as a digital toolkit. Local people were equipped with digital equipment such as PSP handheld gaming devices to directly capture their surroundings and their stories in easy but engaging ways. Based around Google Maps, the toolkit is designed to become an interactive local website that can be easily adopted, adapted and edited by local users. Four community researchers were recruited to be involved in the mapping and catalyst events as well as take the project forward in the future. The project was visible to the community through physical events and an evolving web presence called the Soho Times. 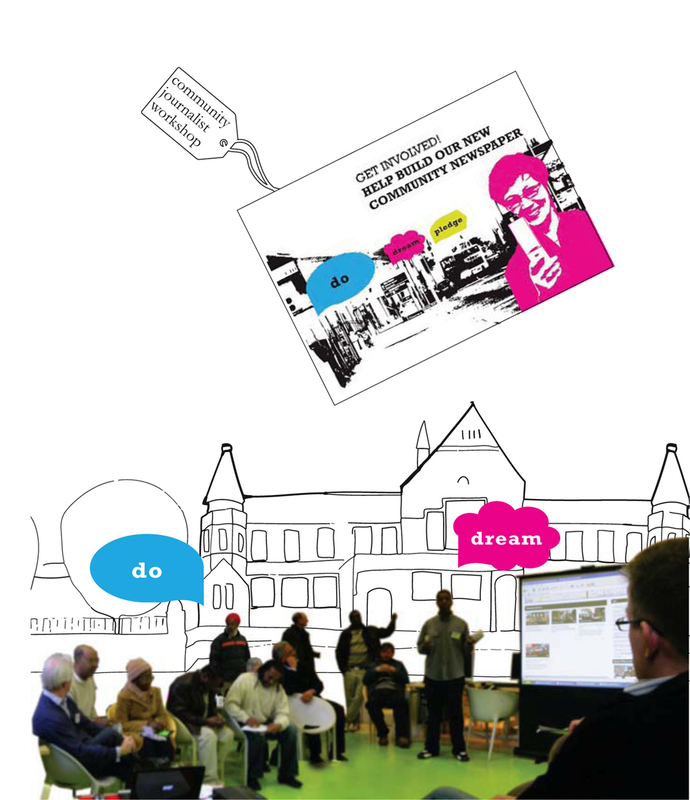 ‘Do – Dream – Pledge’ encouraged participants to tell people about what they are doing and seeing locally, share their dreams and aspirations for their place and to pledge to seek new ways to work with others in the community with an “I will if you will” attitude. Corwen is a small town in North Wales of approximately 2,500 people situated on the A5 between Llangollen and Bala. Like many small towns, Corwen lost its railway line in closures following the Beeching Report. The Llangollen Heritage Railway are currently extending the stream train line from nearby Carrog. Work due for completion in Spring 2014. An increase in tourism would benefit local economic prospects, local expenditure and create greater footfall. In 2010 Addo were appointed by the Partneriaerth Corwen Partnership to engage an artist in residence to explore the potential of public artworks as a tool to lift the visitor experience of the town and draw visitors from () the proposed station to the town centre. Working with ideas from local people, artist Naomi Leake proposed new gardens and meadows, murals on blank walls and a town trail celebrating the rich history of the town, to create quality, exciting artworks. A seminar exploring these ideas with visiting experts focussed on the implications of these developments for the town’s long term vision. A third stage of the project began in March 2013 with an artist-in-residency looking at developing the “wet-meadow” idea adjacent to the railway and town. Camp Little Hope, an international artist collective, based in the USA, developed an environmental garden in the field space, along-side proposals for further arts interventions. The arts-led regeneration activity is currently the subject of further funding bids. The project demonstrates the value that can be brought to a project by close working and consultation between a specialist consultant and local people. Between January 2013 and July 2014 Pidgin Perfect will carry out a series of temporary live projects to engage the public with stalled spaces in an effort to get them thinking differently about how these spaces could be used in the future. For the first of these live projects, Pidgin Perfect collaborated with Glasgow Youth Film Festival and Glasgow Youth Film Festival (GYFF) to produce an interactive screening of ‘Girl Walk // All Day’, as part of the 2013 programme. This special collaboration culminated in an outdoor screening of the 90 minute music video, set in New York, which took place on a very wet and cold evening in February. Pidgin Perfect worked with the GYFF Youth Team and three dance organisations based in Glasgow to produce the ‘Temporary Cinema Event’ on the embankment of the River Clyde. The dance organisation Dance House collaborated to organise a flash mob ‘Dance Walk’ which danced its way through the city from the Glasgow Film Theatre to the pop up cinema site gathering a public audience along the way. They also worked closely with DanceHQ and 1 Blud Crew to choreograph an interactive dance routine which accompanied the energy in Girl Walk // All Day and encouraged audience participation. The dramatic transformation of the redundant and grey stalled space site into an inspiring and engaging performance theatre for one night only brought a new energy and audience to the site, changing the public perception of the purpose and potential uses of the site.